Subtle styling changes, including headlamps and turn lenses that wrapped into the front guards, engineering refinements and equipment upgrades characterised the VP range. This model saw the introduction of independent rear suspension (IRS) and anti-lock brakes (ABS). All models featured remote central locking and a sophisticated anti-theft system. Calais had a body computer which controlled a range of functions, including speed-sensitive power steering and automatic lights out. 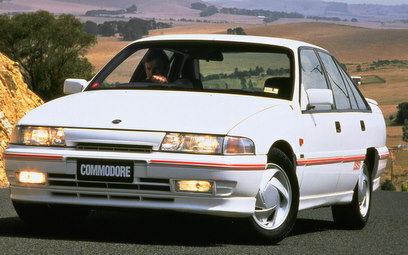 The VP Holden Commodore was always going to be a face-lifted VN, however there were considerable and detailed improvements made over the latter model. Independent Rear Suspension (IRS) was introduced, fitted as standard equipment on the Calais and Commodore SS and optional across the range, the system being adapted from the long wheelbase VQ. On the exterior the Holden engineers kept changes to a minimum, the futuristic looking clear acrylic cover running across the length and at the top of the grille of the Executive model always being contentious (others models used a colour coded version). Base price when new: $23,992.